Are LinkedIn Endorsements A Sham? For those who are moderately active on LinkedIn, you probably have your fair share of connections that you really don’t know, or don’t know well. You most definitely have connections to people who you have not worked with at the same company and you know through networking, community settings, industry associations. That’s great. That is what LinkedIn is for, to connect people to other people in the professional arena. LinkedIn has a lot of great tools to showcase your talents, skills, accomplishments and expertise. I love the LinkedIn platform and the visibility it gives me to others, and the visibility I get on people I am interested in connecting with. There is no doubt that LinkedIn is a great tool. One tool that I loved at first, and am completely unimpressed with now are the endorsements for skills and expertise. I loved it at first because it was a great way to get endorsements for a single skill or talent, without having to give a person a full write up like in the recommendations section. But as time goes on, I notice that I am getting endorsed for skills and expertise by people that either I don’t know or by people who I do know, but have not seen me demonstrate those particular skills and expertise. I can’t be the only person seeing this. I personally will never endorse someone unless I have seen their skills and expertise in action. I think it’s dishonest otherwise. I believe that part of the problem is that LinkedIn enables you to mass endorse people without much effort. I wish it were more closely aligned to the recommendation section where their has to be some sort of proactive action taken by the recipient asking for it, or the endorser being so impressed they want to make the endorsement without being prompted by LinkedIn. Let me be real transparent with you on my own skill and expertise listing and endorsements. Below is a list of my top three endorsed skill and expertise. Social Media Marketing: 36 total endorsements, 18 by people who have no clue whether or not I am good at it. Marketing Management: 34 total endorsements, 11 by people who have never interacted with me in a marketing role. 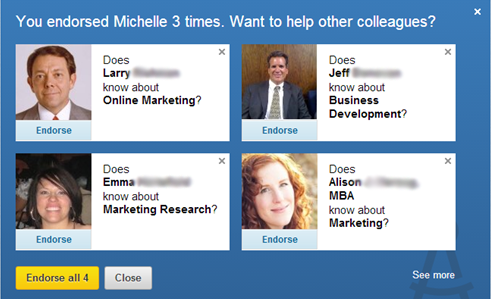 Marketing Strategy: 30 total endorsements, 5of which I have never had a marketing conversation with. With a little deeper dive I discovered that there are three individuals whom I have never met before in my life who have endorsed me for 5-8 categories each. My favorite is this. Somehow I got connected to a guy I interviewed with many years ago, but did not get hired. He posts great stuff, we eventually somehow became connected on other social profiles. He always share great stuff and I love the content he shares. But all I really know about him is what I share and vice versa. This former potential boss has endorsed me for 11 different categories. Consequently, I have begun to care less and less about the endorsements I do have, and the endorsements others have. What are your thoughts about LinkedIn’s endorsement feature for a connections skills expertise?